Knock! Knock! – Just a reminder about our orders for Novembers Delivery closing on Monday the 10th. Please give us a shout with your order so that we can get crackling. 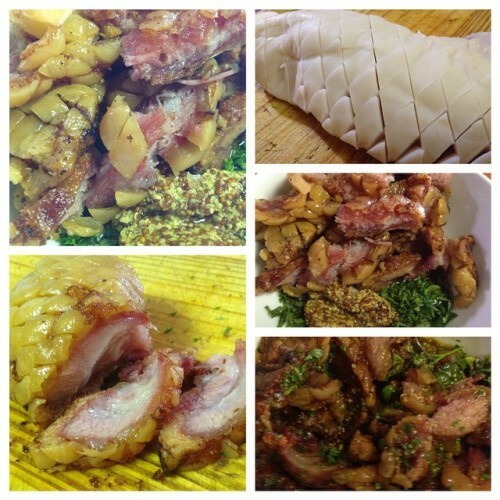 A lot of people have asked what the jowl is and how to cook it. Never to miss an opportunity to be a little cheeky, basically, it is bacon of the cheek. There are some more trendy names for it though: Guanciale, Cured Pork Cheek, Jowl etc. It is quite a difficult one to explain what to do with it because it is so versatile. It’s like trying to come up with a recipe for bacon. Bacon makes everything better. Try it as a guanciale spaghetti carbonara. Or dissolved in a tomato sauce. The jowl is a little tricky because sometimes less is often more. If you use it as a direct replacement for bacon you need to take into account the additional fat. You can also use it as a replacement to the fat you would usually use. Because of its richness it is really good with a sour component to cut the fat. Simply sliced and eaten with some sort of pickle or with a glass of crisp wine is delicious. One way to get used to cooking the jowl is to cook it separately. You can slice it and render the fat out and use it as a textural crunch accompaniment or roast it whole. When roasting score the fat, there is a thinner and a thicker side of fat, try to score it proportionally. Place the whole scored jowl on a baking tray and place it into a cold – non preheated – oven. Fire up the oven to a lowish heat, say 165 C and let it heat up and render the fat out simultaneously. Occasionally you can pour out the rendered fat. Keep it though. Having smoked rendered pork fat in the fridge is not terrible added to any vegetable based dish like Neapolitan sauce or an Arrabbiata sauce. The jowl is very rich and if used incorrectly can be sickly, but get it right and it will be a treasure in your freezer. We hope to hear from you regarding Novembers Delivery as well as if you are interested in any of our custom-made December treats.